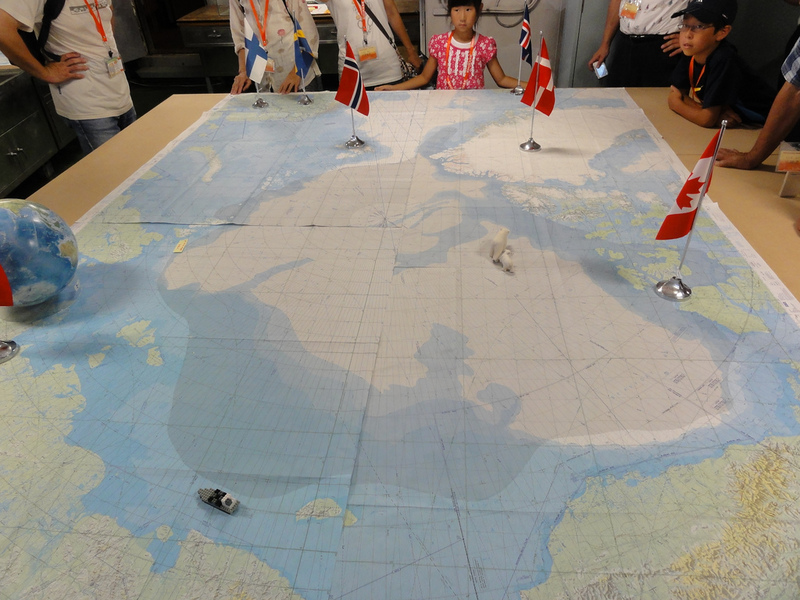 Students onboard Japan’s Shirase icebreaker during a general tour. Photo: Flickr/Cookie M.
For interested readers, the peer-reviewed journal Eurasian Geography and Economics has just published my article, “North by Northeast: Toward an Asian-Arctic Region.” The article consists of research I completed for the dissertation for my MPhil in Polar Studies at the Scott Polar Research Institute at the University of Cambridge. In the article, I analyze the recent activities of China, South Korea, and Japan in the Arctic while also placing them in a historical context. I also examine their polar activities as part of the wider thrust of the East Asian countries into the maritime domain – whether in the Arctic, Pacific, or even elsewhere. In more detail, the article investigates the economics and politics of the emerging Asian-Arctic region. This is an area characterized by a growing amount of energy shipment, especially the transport of LNG from Arctic projects to the receiving terminals of East Asia. A lot of people talk about the “European Arctic (a search on Google turns up 89,700 results), which centers on the North Atlantic and the Arctic. Yet the “Asian Arctic” is not mentioned nearly as much (only 17,700 hits). This is a region centered on the North Pacific and the Arctic Ocean,which China, South Korea, and Japan can easily reach via the Bering Strait. Cities such as Dalian, Busan, and Vladivostok are all nodes in this increasingly interconnected region. At the same time, as much of the economic development of the Arctic in recent years has taken place at sea, the activities and investment of Asian countries can be felt in the Atlantic in cities like Reykjavik. A few paragraphs are thus devoted to considering Iceland’s status as a potential foothold for China to enhance its Arctic presence. Returning to the Pacific, there are strong trade links to the Arctic countries of Canada and the U.S. via the North Pacific Great Circle Route (NPGCR), which cuts across the ocean from East Asia, hitting sub-Arctic ports such as Dutch Harbor, Alaska en route to Vancouver and Seattle. The NPGCR is still a more important shipping lane for East Asia than the Northern Sea Route, and LNG production is booming in Canada and the U.S. Hence, it’s helpful to think of East Asia’s interests in a broader range of northern resources and trade opportunities rather than just the strictly-defined Arctic region itself. Access to the article is firewalled, so if you are unable to read it, please contact me at the bottom of this page for a copy. I have one additional article forthcoming in the journal Strategic Analysis, which will focus specifically on South Korea’s activities in the Arctic. The issue will be a special edition that includes articles on Asia and the Arctic presented at the “Geopolitics of the Arctic” conference hosted by the Institute for Defence Studies and Analyses in New Delhi, India in September 2013. This paper, like my latest publication, will cover topics that I often discuss on this blog. Hence, these articles can be seen as more extended research into these subjects as I attempt to think through the issues a little bit more and tie them into theory. Thanks, Uttarayan! I’ll make that edit.